Imagine having to find the time in your busy schedule to prepare a mailer, print multiple copies, then stuff, address, stamp, and mail them. There aren’t enough hours in the day. Not only does Dallas Printing have the ability to design and print your items, but we have the capability to stuff them into their individual envelopes, address, and meter your mail pieces — all within a matter of seconds! Dallas Printing houses a state-of-the-art addressing system that applies the address information directly to your mail piece. 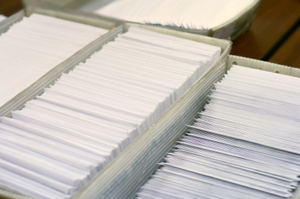 Plus, we can merge your address database with your letter in order to personalize your mail piece even further. We can laser print at the speed of 10,500 pieces per hour. Then we’ll inkjet address the envelope, sort, and deliver your mail to the post office. Just leave it to us — we’ll get your word out in no time!